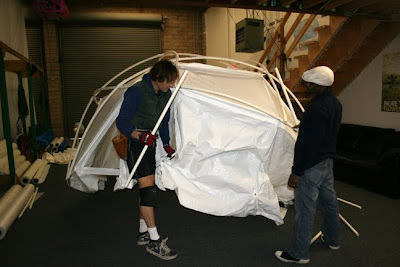 We ordered three 14-foot dome relief tents from Shelter Systems, a Santa Cruz company. Soon after the earthquake rocked Haiti, the U.N. ordered 3000 tents from Shelter Systems, their biggest order ever. Several mission groups have ordered 100 or 200 to go to Haiti also. 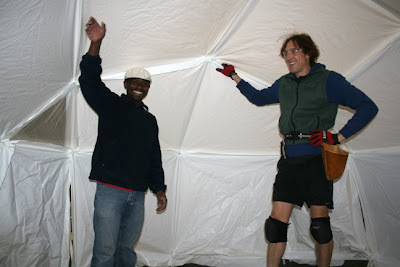 Up until now, these dome tents were most popular at Burning Man gatherings. Jeff, who works at their westside warehouse, was super nice and showed Andre how to assemble one in just 25 minutes. You don't need any tools, and they go together like tinker toys. 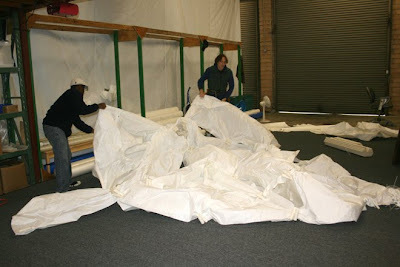 The finished product is strong, light, durable, comfy, private, well ventilated, etc. etc. They don't have any seams or zippers to rip. 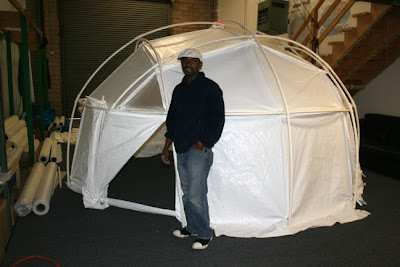 Eleanor Hamner, the company's business manager, spent 13 years of her childhood living in a dome tent in Aptos, CA. Needless to say, her parents who started Shelter Systems, were hippies. Her dad still sports long gray hair and beard. "But we all live in houses now," says Eleanor, even though she says she loved living in the dome tent. The bad news is we just found out on American Airlines website that they have new restrictions for flights to Haiti. Originally, when we bought Andre's ticket for March 8, we were told he could take two 50-pound bags, one 40-pound carry-on and a day pack for free, plus a maximum of three more 50-pound bags for $100 each. We were preparing to take the max. Now we find out he can only take one 50-pound extra bag. 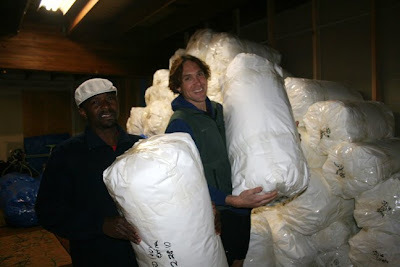 We're also concerned about the bulk of the relief tents, even though they only weigh 43 pounds each. Our plan is to get to the airport three hours early on March 8 and bring three extra bags. I will use all my chutzpah to try to get them on the plane. If not, I bring two back home until I fly over to Haiti in a week or 10 days. I decided to wait until Andre gets in touch with me from Haiti about the situation over there before I make my reservation. A friend who has lots of frequent flyer miles has offered to let me have them, but I'm going to pay her half the price of a ticket. That's really generous of her. Andre's family has been trying to discourage us from coming. His brother asked him if he's really ready to see his country in ruins. It sounds like such a desperate situation. Maybe we won't stay a month after all. We'll see once we get there.